OK, I admit it. This whole Northam thing has me cracking up, not because I enjoy watching the crash and burn of any poor soul, but, rather, because I find it deliciously delightful that finally, the left is drowning in the same political correctness they have been shoving down the throats of everyday Americans for three decades or more. 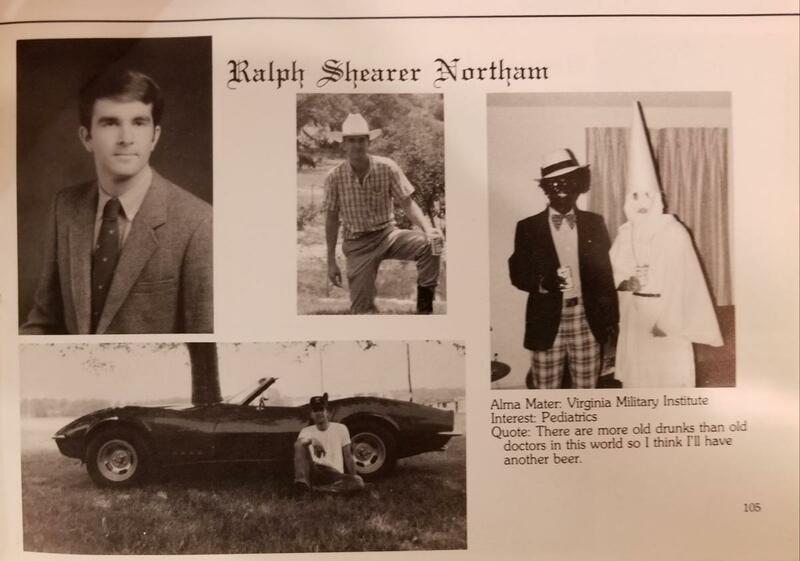 Ralph Northam, as a young medical school student in 1984, thought it would be cool to attend a costume party (presumably Halloween) as half of a KKK couple. You could do that in 1984. But not today, lest you be flayed by the politically correct mainstream media, marching in lockstep with their masters, the Democrat Party. So, what was a joke in 1984 is justifiable political homicide today should anyone discover that you made such a joke, even if it was 35 years ago when the social and political climate of America was vastly different than the stifling, choking climate we find ourselves in today where a single word or photograph may be used to condemn a political opponent to the wasteland of political obscurity forever. The situation Ralph Northam has found himself in reminds me of the photo Ivanka Trump posted to Twitter of her husband and son on a family vacation aboard a boat on a Florida lake. 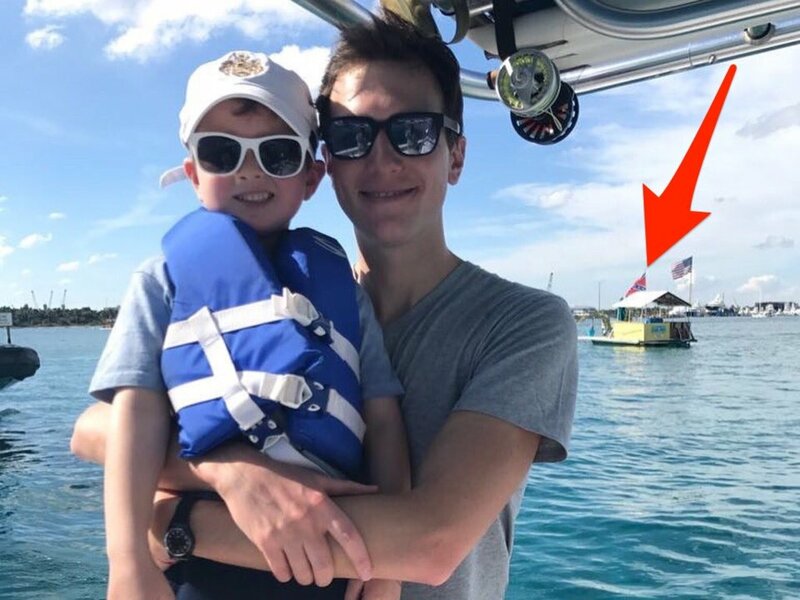 In the set of four photos, one pictured Jared Kushner holding his son aboard the boat. In the distance there is what appears to be a homemade party barge flying two flags, the American flag and the flag most people believe is the Confederate flag, even though it isn’t. It is the battle flag of the Army of Tennessee of Civil War lore, but I digress. In a hearbeat, the mainstream media and liberals everywhere came out of the woodwork to condemn Ivanka and the Trump family for, as they saw it, supporting racism. To them, it wasn’t her family’s fun-filled vacation that Ivanka was tweeting to the world, it was racism of the deepest and darkest sort. The reply to Geoff Keller’s tweet, below, regarding Ivanka’s photo, is proof of how far we have fallen and just how sick half of America is. Anyone remember Blazing Saddles? All of this Northam noise reminds me of that movie, which remains one of my favorite films of all time and absolutely my favorite comedy, and coincidentally, featured a wacky governor. Released 45 years ago in February 1974, Blazing Saddles was an opportunity for us Americans to look in the mirror and laugh at ourselves, our petty differences, the history we have painfully shed but Democrats will not allow us to forget, but more importantly the great strides we have made socially by embracing our similarities and being friends instead of obediently submitting to the politics of division, part and parcel of the Democrat Party agenda. Blazing Saddles could never be released today. Liberals would make certain that Mel Brooks never sees the outside of a prison cell again. If you haven’t seen Blazing Saddles, you must. Set in the American Wild West of 1874, It is hilarious in a politically incorrect way, spoofing every modern American convention you can think of. Following is a pic of Gene Wilder, portraying a famous gunslinger, the Waco Kid, and his buddy, Bart (Cleavon Little), the black town sheriff, trying to infiltrate a gang of bad guys by pretending to be Ku Klux Klan members. When Bart’s skin color blows their cover, they run for the hills. See how easy it was for us to laugh 40 years ago about things that happened in our history that no longer matter? That’s right, those things no longer matter. Why can’t we laugh again? It is the best medicine known to man. The reason is that Democrat politicians and their useful liberal idiots won’t allow it. There is no amount of self-flagellation that will satisfy them. The politics of division is all they have and is all that keeps them relevant. My favorite scene from Blazing Saddles, a bad guy signing up to be a member of the governor’s deputized force to run the citizens out of Rock Ridge…. 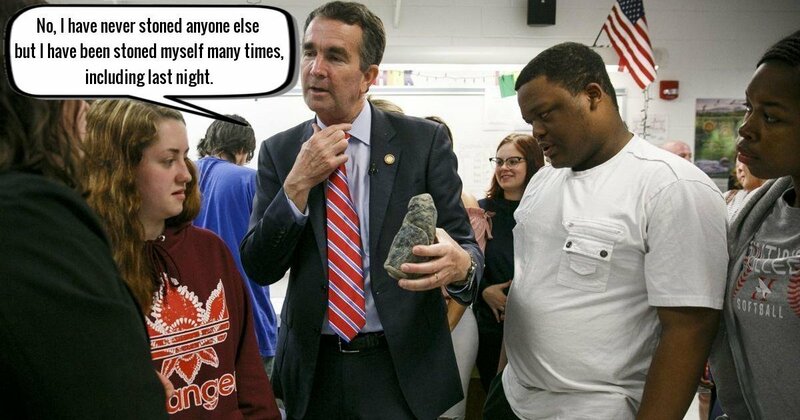 So, yes, by all means, you sour Democrats and Republicans and talking heads, skewer Democrat Governor Northam if you must for a 35-year-old joke the same way you skewer Republicans every day. As for me, I’m going to grab another beer and enjoy the show.